Tracey DeBlase Huston, Penn State’s Vice President for Outreach, has more than 30 years of experience in higher education and over two decades of service to Penn State. Having served as the Interim Vice President for Outreach since January 2017, Tracey officially became the permanent leader of Outreach on July 1, 2018. 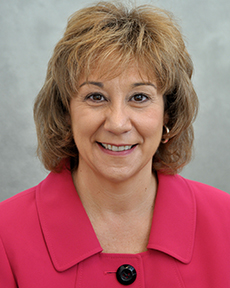 Prior to her appointment as Vice President for Outreach, Tracey was the Associate Vice President for Marketing and Enrollment Services for Outreach and Online Education. She also previously served as the Executive Director for Outreach Marketing and Communications, and as Director of Outreach Communications. Before her arrival at Penn State in 1994, Tracey served in two different roles at Juniata College. She was the Assistant Director of Public Relations and the Director of Sports Information. In 2017, Tracey was appointed treasurer of the Executive Board of the National Engaged Scholarship Consortium. She previously served on the National Association of State Universities and Land Grant Colleges Extension Committee on Organization and Policy, Marketing and Communications Task Force from 2006 to 2012 and as Vice Chair for Communications for the University Professional and Continuing Education Association Engagement and Outreach Community of Practice in 2008. Her work has been recognized nationally with awards from the Council for Advancement and Support of Education and the University Professional Continuing Education Association.